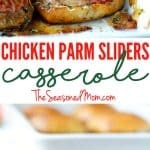 Super easy, delicious and fun Chicken Parmesan Sliders Casserole. This dish is packed with flavor and couldn't be easier to put together. Kids love it! This Chicken Parmesan Sliders Casserole is a quick and easy family-friendly weeknight dinner or a perfect make-ahead party dish! No one can resist the crispy breaded chicken tucked inside sweet dinner rolls and covered in cheese and Italian butter sauce! This is a sponsored post written by me on behalf of Sister Schubert’s®. All opinions are 100% mine. You guys, THIS is it! The easy and delicious dinner that your family has been waiting for!! I kid you not — everyone is going to LOVE this dish (and you’re going to love how simple it is to prepare)! Since we all have really busy schedules, I make it my mission to come up with simple recipes that anyone can toss together with a few basic ingredients and just a couple of minutes of hands-on time. Because while sharing a meal with my family is incredibly important, the reality is that at the end of the day, most of us don’t want to be fussing around in the kitchen to prepare an elaborate meal. Instead, we’re dealing with homework, cranky toddlers, and hungry bellies! That’s exactly why I keep my kitchen stocked with certain staples that I know I can rely on in a pinch. These are the ingredients that make everyone happy, that don’t require much effort on my part, and that (obviously) taste GOOD! With a bag of Sister Schubert’s® Dinner Yeast Rolls from the frozen section, some chicken nuggets (always a favorite with the boys), a jar of marinara, and some cheese, I basically had dinner ready to GO! These ingredients are a match made in heaven, right?! 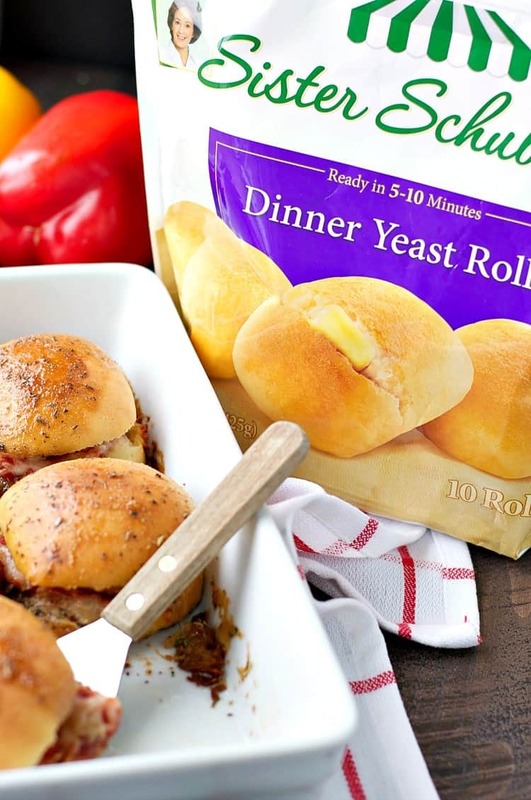 As a mom, I love that the Sister Schubert’s® Dinner Yeast Rolls have 0 grams of trans fat, no preservatives, no artificial flavors, and they’re ready in 5-10 minutes! Plus, they come in a resealable package which is super-convenient on those evenings when I don’t need to bake all 10 rolls at once. But you know what? My kids (and husband) really love the taste of Sister Schubert’s® Dinner Yeast Rolls. They are still made from the same recipe passed down from Sister’s great-grandmother for generations…and you can tell! They taste homemade, and they are an easy side to pair with almost any dinner! Most importantly, Sister Schubert’s® helps bring everyone together to share special family moments — whether it’s a holiday feast, a quick weeknight dinner, or a leisurely Sunday supper. In a small saucepan, melt butter over medium heat. Whisk in brown sugar, Worcestershire sauce, Italian seasoning, garlic powder, and onion powder. Whisk butter mixture until brown sugar is completely dissolved. Set aside. Place the bottoms of the rolls in a single layer to cover the bottom of the prepared baking dish. Spread marinara sauce on the bottom of each roll. 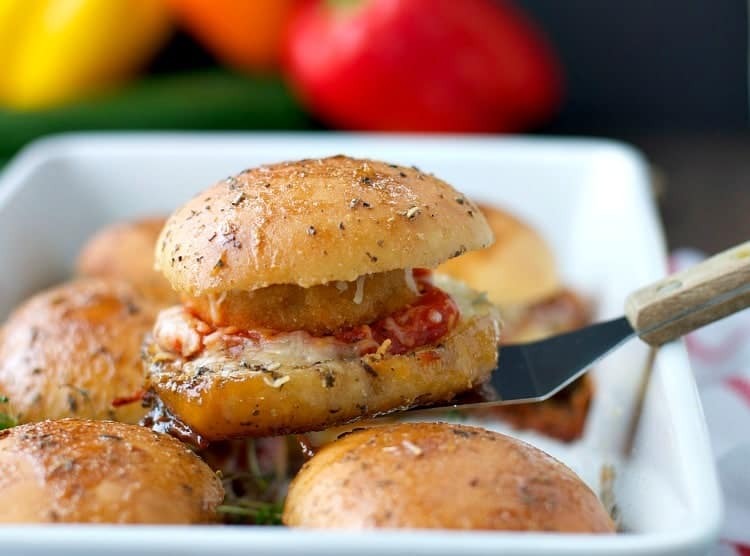 Top each roll with 1 chicken nugget, mozzarella cheese, and Parmesan cheese. Replace tops. Cover with aluminum foil and bake. Remove foil and bake uncovered until golden brown. It’s one of those dishes that I rely on because it accommodates my crazy life, it utilizes basic kitchen ingredients, and it keeps my hungry boys happy. I hope that your family loves the casserole as much as mine does! This kid-friendly casserole can be made and baked right away, or you can prep it in advance (even overnight!) and bake it when necessary. Leftovers can be kept in the fridge and reheated, you can also freeze these. While chicken is in the oven, spray a large casserole dish (about 13-inch by 9-inch) with cooking spray and set aside. Spread about 1 tablespoon of marinara sauce on the bottom of each roll. 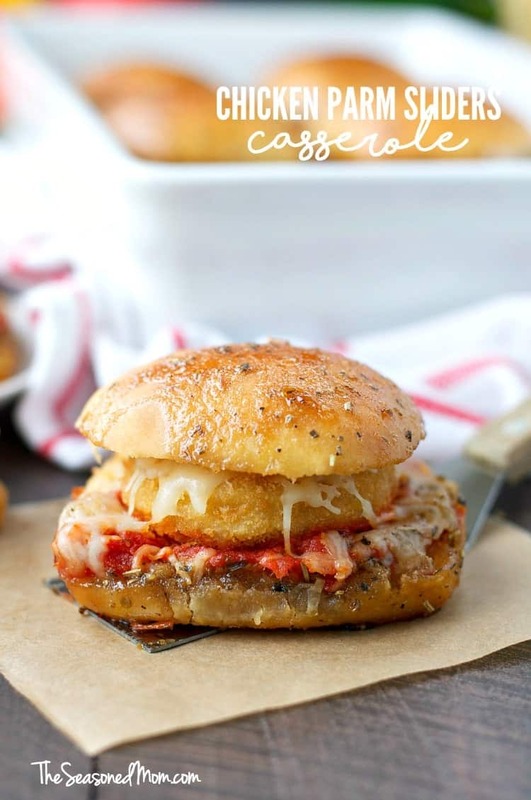 Top each roll with 1 chicken nugget, 1 tablespoon of mozzarella cheese, and ½ teaspoon of Parmesan cheese. Replace tops. Cover with aluminum foil and bake at 350 degrees F for 25 minutes. And if you’re looking for even more mealtime inspiration, be sure to check out the Sister Schubert’s® Facebook Page! My mouth is watering just looking at these, Blair! 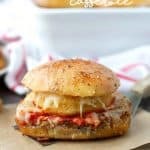 Such a great idea to jazz up chicken parmesan! My husband loves chicken parm but I’m not actually the biggest fan. But, I definitely think I would devour this in no time. Love how you got creative! Thanks, Gayle! Yep, this dish might just change your mind (and it will totally keep husbands happy)! This is so easy! I’m actually hungry for chicken parm now. Hehe! Hah, me too, Megan! I could eat this again tonight! Holy moly, I love this idea! Excuse me while I wipe the drool off of my keyboard and head directly to the store. So excited to try these out! Hah, hah! Thanks, Karly! You’re so sweet. 🙂 They’re definitely YUM! WHOA! UM….. I am not sure why I have never seen such an item on a restaurant menu before!!! HOT DAMN! Hah, thanks GiGi!! They’re sooooooo good! What do you serve with these sliders? Hi, Jill! I’d just serve a simple salad on the side for a light meal! 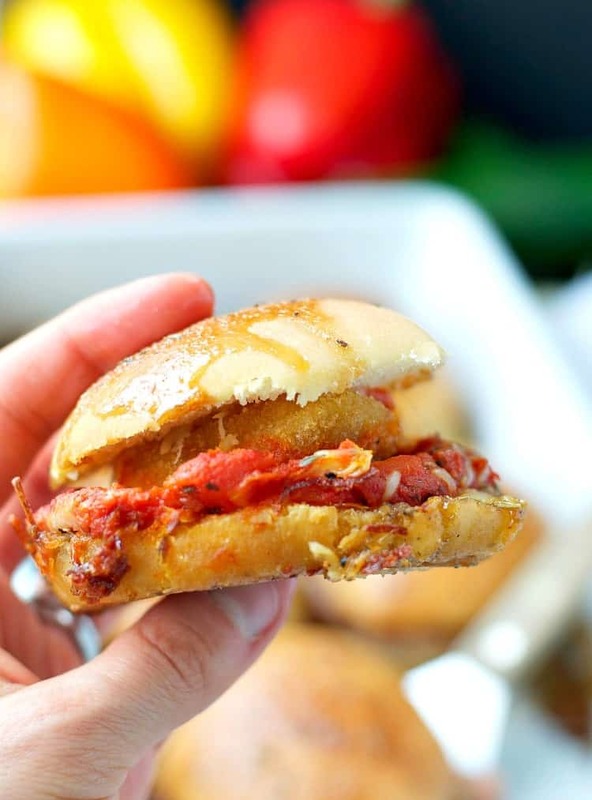 Use an Italian vinaigrette or a Caesar dressing to stick with the Italian flavors in the sliders. Delish! Oh, and my husband always wants chips with his sandwiches, so that’s another good option if you’re looking to bulk up the meal! Are you supposed to bake these rolls before assembling the sandwiches? Hi, Kris! Nope, no need to bake them first. Just thaw them and slice them in half and you’re good to go! Forgot to ask, do you usually use all the butter sauce? What a great idea, I love the sound of that butter that’s brushed on top, so delicious!